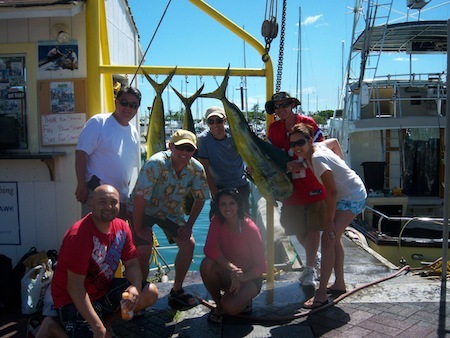 Kamiko, Wayne, Bruce, Rick, Dane and Nadia with 3 Mahi Mahi! 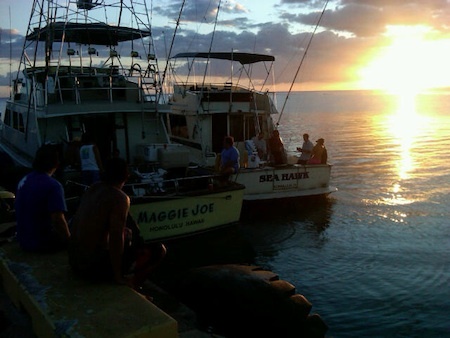 Mahalo to Kamiko, Wayne, Bruce, Rick, Dane and Nadia for choosing Maggie Joe Sport Fishing! The group spent the day with Captain Mike aboard the Maggie Joe on a 3/4 sport fishing charter. While deep sea fishing outside of Waikiki, Oahu they hauled in 3 Mahi Mahi! Enjoy the dinner and aloha! Mahalo to Aaron for choosing Maggie Joe Sport Fishing! 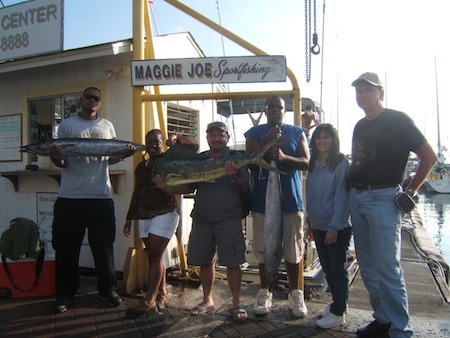 Aaron and his mates joined us aboard the Maggie Joe for a full day sport fishing charter on 9/26/11. 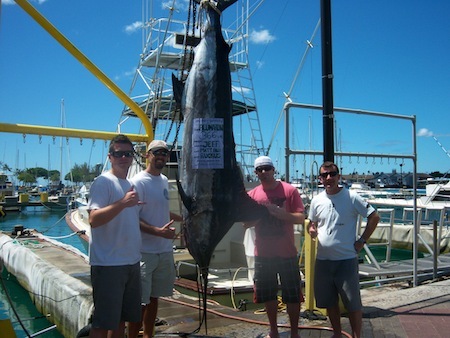 Aaron hauled in this nice 165 lb Blue Marlin while deep sea fishing outside of Honolulu, Oahu! Congratulations and hopefully we see you again soon! Aloha! Gerald with 150 lb Blue Marlin! Marlin beware! 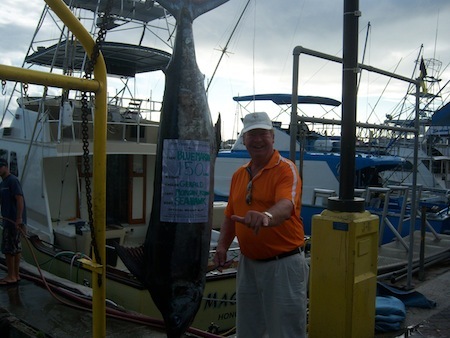 Gerald hauled in his 2nd Blue Marlin with Maggie Joe Sport Fishing this week with this 150 lb Blue Marlin. He spent this day on a full day sport fishing charter and hauled in this beauty while deep sea fishing outside of Honolulu, Oahu! 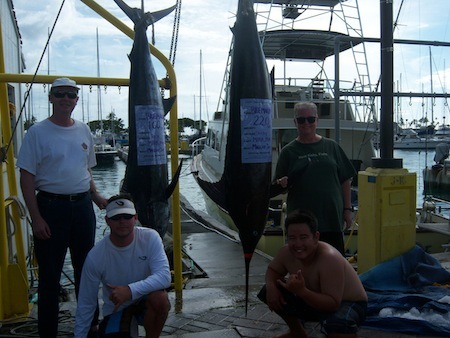 Mahalo for choosing Maggie Joe Sport Fishing! We’d love to have you back any time! Mahalo to Rick and Shirley for choosing Maggie Joe Sport Fishing! It was a fun filled and exciting day out on the water as Captain Mark did a great job finding the fish. 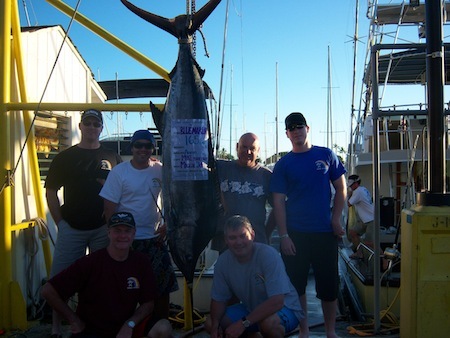 While deep sea fishing outside of Honolulu, Oahu Rick hauled in this nice 160 lb Blue Marlin while Shirley, not to be outdone, hauled in this nice 220 lb Blue Marlin. Aloha and hopefully we see you guys out on the water again soon! Angler Hana with 130 lb Blue Marlin! 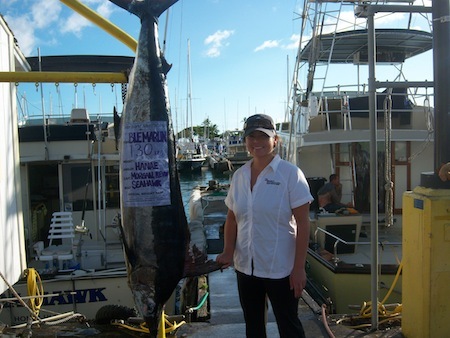 Mahalo to Hana for choosing Maggie Joe Sport Fishing! Angler, Hana, hauled in this nice 130 lb Blue Marlin while deep sea fishing outside of Honolulu, Oahu aboard the Sea Hawk! Congratulations and we hope to see you out on the water again soon! Aloha! 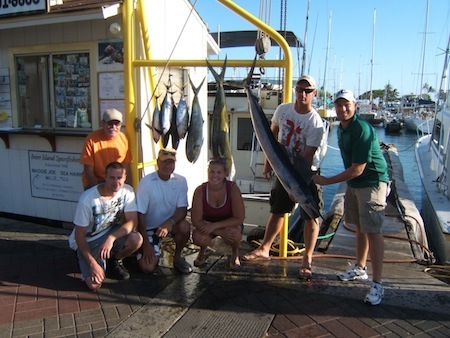 Mahalo to Cory, Gary, Ron, Eli, Sarah and Nick for choosing Maggie Joe Sport Fishing! The group departed Kewalo Basin, next to Waikiki, on a sport fishing charter aboard the Ruckus. While deep sea fishing outside of Honolulu, Oahu they hauled in 4 Shibi, 2 Mahi Mahi and 1 Spearfish! Great job and enjoy dinner! Aloha!